B&W, 1946	, 83 mins. 49 secs. 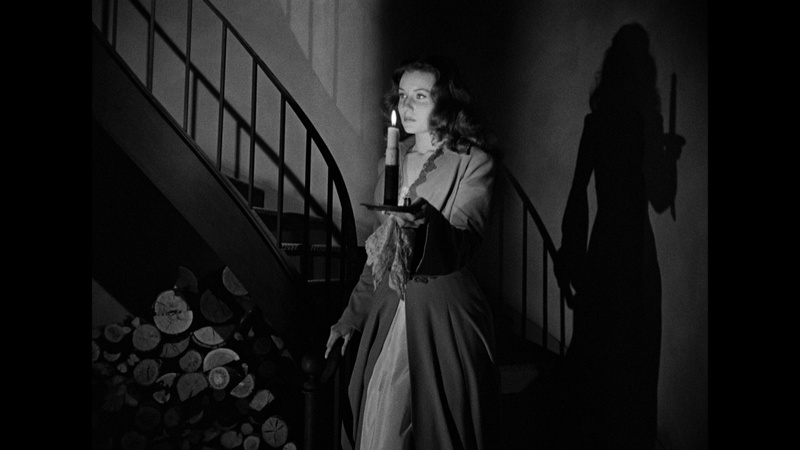 This stylish Gothic yarn was one of Hollywood's first attempts at a pure horror film after the trauma of World War II, and despite the turn of the century setting, it seems remarkably contemporary in its effective scares and narrative devices that influenced decades of psycho on the loose tales including See No Evil and the terrifying "An Unlocked Window" episode of The Alfred Hitchcock Hour. 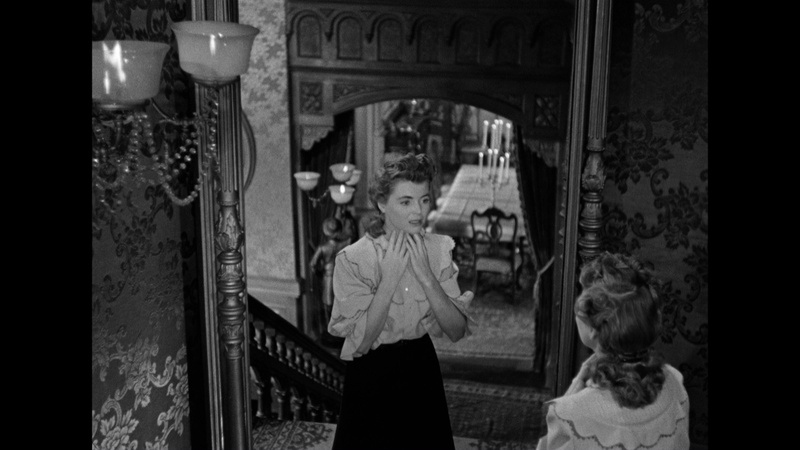 Dorothy McGuire stars as Helen, a mute servant girl in the home of ailing Mrs. Warren (Barrymore). Several town girls have fallen prey to a serial killer who targets females with "afflictions" of some kind. 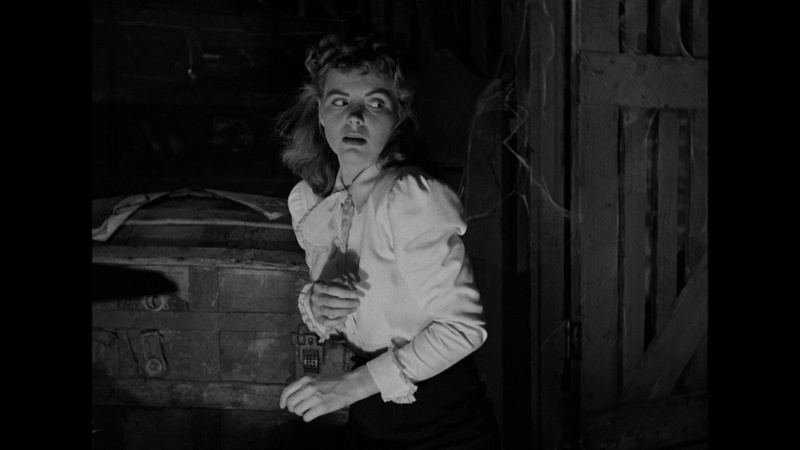 Helen has already caught the eye of young Dr. Parry (Val Lewton regular Smith), who is implored by Mrs. Warren to take her away before the killer claims her next. Unfortunately a nasty storm traps the residents of the Warren home inside for the evening, and a death inside reveals that the killer is indeed among the family. Could it be one of the Warren sons, Steven (Oliver) or Albert (Brent)? 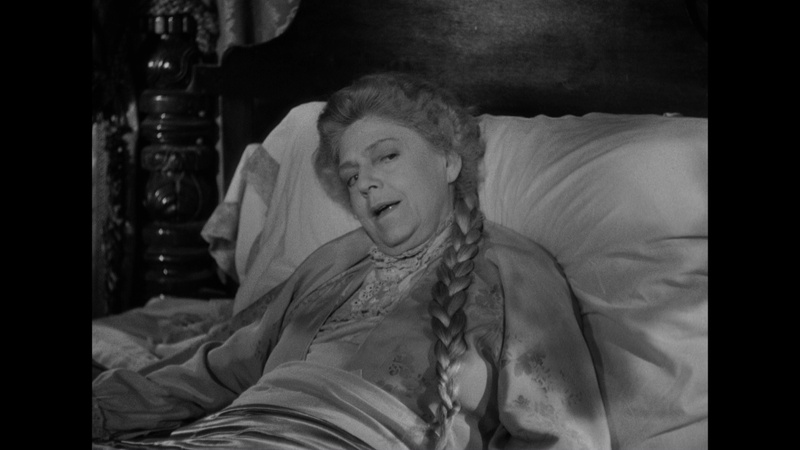 Or the voluptuous Blanche (Fleming)? Or perhaps the soused cook, Mrs. Oates (Lanchester)? Before long Helen finds herself alone in the dark old house, using only her wits to do battle with the faceless maniac. Though briefly released with a very soft transfer on video and laserdisc by Fox, The Spiral Staircase was surprisingly difficult to see for many years and earned its reputation primarily through word of mouth and scarce TV airings through the '90s. Anchor Bay's 2001 DVD was a welcome step up with a solid presentation given the format's early history, and it also includes the rather bland theatrical trailer that makes this look like an average potboiler. In 2007, MGM issues the film with a lesser interlaced presentation that marked a surprising step down, with a random trailer for Secret Window included for no good reason as the sole extra. In 2018, the film got a major upgrade courtesy of a fresh 4K restoration used as the source for Kino Lorber's Blu-ray and DVD editions. Apart from the inevitably soft and lesser quality opening titles (which has always been the case), the film looks quite impressive here with rich black shadows and fine detail in textures like lace, hair, and flickering candles. Any admirer of the film will be giddy, and the DTS-HD MA English mono track (with optional English SDH subtitles) is about as good as this will ever likely sound. 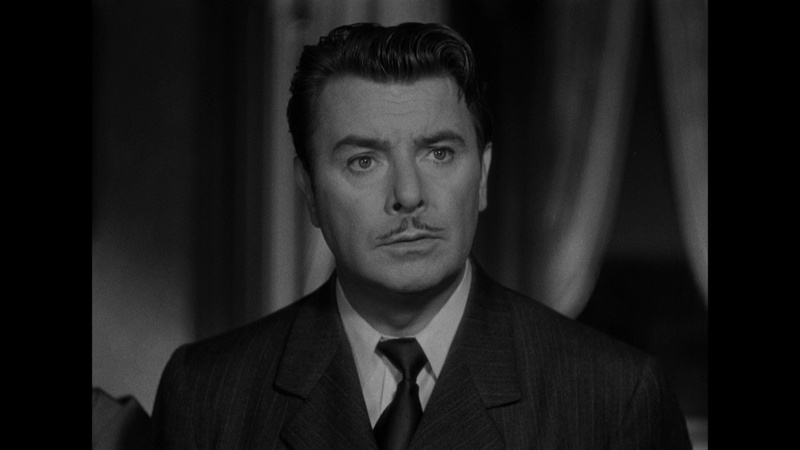 A scholarly and thorough new audio commentary by film historian Imogen Sara Smith guides you through the myriad genres explored here -- film noir and Gothic melodrama chiefly -- while analyzing the layers of meaning at work here including the depiction of muteness and the rivalry motif running through the characters. 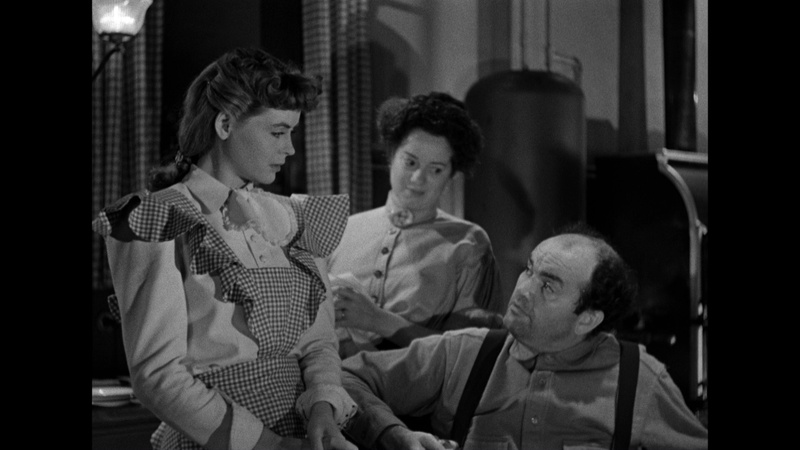 Also included is a half-hour 1945 Screen Director’s Playhouse radio dramatization with McGuire and Siodmak, which makes some interesting changes like having Helen narrate (of course since she wouldn't have much to say otherwise!) and kicking off with a depiction of the traumatic event that causes Helen's muteness. The trailer is also included along with bonus ones for Cry of the City, I Wake Up Screaming, Deadline - U.S.A., and Daisy Kenyon.